Last week was my brother's birthday. ­Normally he wants ice cream cakes, which is just fine, because I'm not going to make one of those (I have enough trouble with icing). This year however my brother called an audible (that's about the only football term I know) and asked for his favourite cake “Funfetti,” aka “basic white cake with sprinkles inside.” I can't figure out why he likes it so much, you can't taste the sprinkles. I think it coms down to the enjoyment he gets from seeing them. That's the type of person he is, happy go lucky (most of the time). And I know what you're thinking: “Why oh why would he do this again? 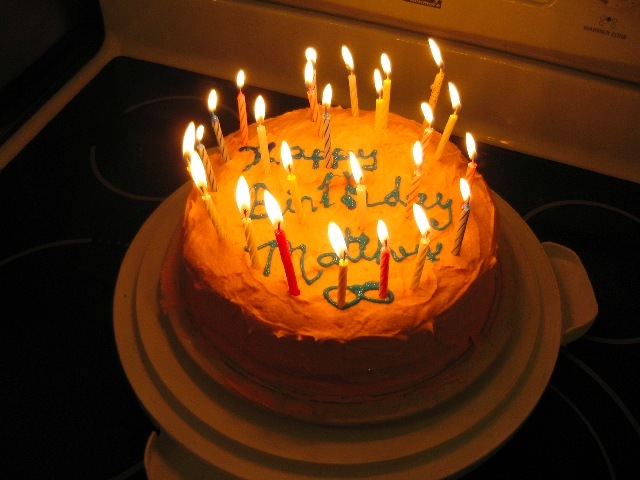 Why would he bake another cake for someone's birthday?” I don't have any excuse other then my complete and utter insanity. To my brother's credit he would have been happy with a box mix, it's what he likes after all. But during the summer I had made him Funfetti Cupcakes from scratch and I wanted to surprise him with a cake. At this point there was an alarm going off in my head, but like most alarms, I promptly ignored it. I spent a lot of time considering what recipe to use. Do I go with the one I made the cupcakes from or another that seemed more geared towards being a cake (i.e. less flour)? 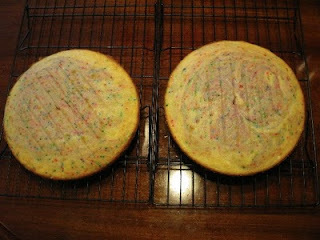 Often the two are interchangeable, so I went with what he liked previously, turning the Funfetti Cupcake recipe from Cookie Madness into a cake. This is where alarm number two should have gone off but didn't (and even if it had, I would have likely ignored that one too). For the icing I went with ridiculously sweet. My brother is the type of person who likes icing that tastes like those from the grocery store, you know, the ones too sweet for human consumption. Obviously nothing is better for a diabetic's birthday than icing made with a tonne of sugar, right? I also went ahead and made it a nice bright pink (you would understand if you knew him). However, for the filling I wanted something a little different so I mixed in some unsweetened chocolate. Figuring two 9 inch cake pans would be a good choice I prepared the recipe and into the oven they went. 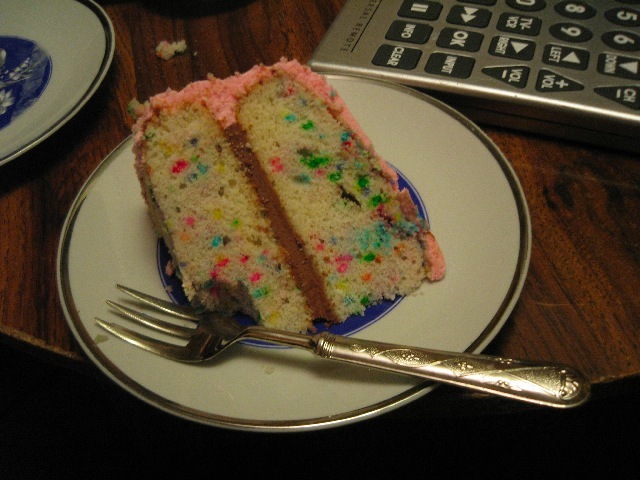 Arguably the most important part of a cake with sprinkles on the inside would be the sprinkles on the inside. This managed to escape me at the time. Thirty seconds into the bake I realized I forgot to add the damned things. My error resulted in a flurry of yelling and swearing as I yanked the pans out of the oven and added the sprinkles. I was already nervous I had over mixed the batter and this wasn't going to help. Regardless, crisis averted, what next? How about an attempt to turn on the oven light that lead to turning off the oven timer instead? More yelling and swearing would follow since I neglected to notice how much time remained. So cakes are out and cooled, time to decorate. 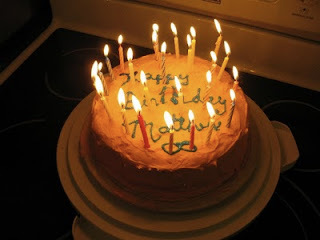 The kitchen was abnormally warm and the icing began to melt and sag, frustrating me further (I hate icing cakes). At least I managed to avoid the instinct to build a level cake this time :). The next night after coming back from a wonderful dinner at Bombay Palace we got down to the “Happy Birthdays” and cake eating. I feared the cake would be dry and to me it was. Whether this was because of over baking, over mixing, or not eating the cake at room temperature, I was not sure. However, my brother and everyone else seemed to like it (but I knew it was dry). As expected, the bright pink icing was sweet enough to drive a person to madness, but it's what my brother likes, so who cares what I think? In contrast, the chocolate filling was a win. The unsweetened chocolate absorbed a lot of the sweetness making it rich and very enjoyable. I will definitely make the icing again with the chocolate, but I will have to be forced to make it again without :). At the end of the night, despite my hang-ups (there never being a shortage), my brother was happy. However, should I attempt this cake again, I'm going with a different recipe. In my opinion this one is better suited for cupcakes (shhh, it'll be easier on the both of us if we just blame the recipe :) ). Preheat oven to 350F and set rack to centre position. Grease two 9 inch round cake pans, line the bottoms with parchment paper, grease bottoms and flour pans. In a medium bowl add flour, baking powder, salt and whisk to combine. In the bowl of a stand mixer beat egg whites to soft peaks. Remove two tablespoons of the measured sugar and gradually add to egg whites. Beat eggs until just before stiff peaks form. Transfer whites to another bowl or prepare a second bowl in mixer. Add butter to mixer bowl and beat until smooth and creamy. Gradually add sugar, and beat until smooth, making sure to scrape sides of the bowl. Add vanilla and almond extracts, beat until combined. Set mixer to low-medium speed. Alternate between adding flour and milk, starting with flour and ending with flour. Scrape sides of the bowl and continue mixing until combined. Completely fold egg whites into batter. Pour batter evenly into prepared cake pans, place in oven, and bake for 25 to 30 minutes. Remove and allow to cool completely before icing (1 to 1.5 hours). In the bowl of a mixer add butter and beat until creamy and smooth. Set speed to low and gradually add sugar until completely combined. Add milk, vanilla and salt and mix until combined. Crank the speed up to high and beat until fluffy. If making chocolate filling remove ¼ of icing from bowl and set aside. If colouring icing, this is where you add it, mixing until desired colour is met. Add chocolate to a small microwave safe bowl and place in microwave until mostly melted. Remove from microwave and stir any chunks of chocolate until fully melted and smooth. Allow to cool for a few minutes. Add melted chocolate to icing and beat until chocolate is incorporated. Place first layer round side down and spread chocolate filling in centre, almost to the edges. Place second layer round side up on filling, pressing down slightly. Begin the hellish process of icing the entire cake. P.s. For everyone's knowledge this cake was better than the boxed one, and not only because it included seldom seen PURPLE sprinkles. Adam... Matthew. You are both insane. 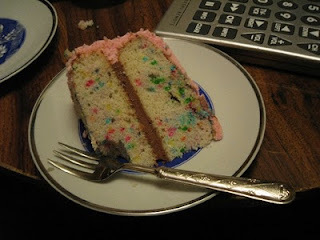 But then, I do now have the slight urge to bake a funfetti cake. I won't, cause I'll have to eat it too, and that would be bad... but hey. Guess I am crazy too. P.S. The sprinkles do look cool on the inside.